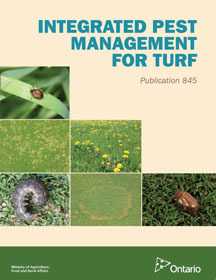 Finally…..one comprehensive resource for turf IPM in Ontario, Integrated Pest Management for Turf, is now available. Integrated Pest Management for Turf has been designed as a field handbook for golf courses, lawn care and the parks sector. It contains well over 100 colour photos of turf diseases and insects. It is recommended study material for the IPM accreditation exam for the Golf Course IPM Accreditation Program which is required under The Pesticides Act and Regulation 63/09 and is administered by the IPM Council of Canada. It contains extensive information on the diseases, insects, and weeds that are found in turf in Ontario, including a turf disease identification key, turf disease time profile, turf scouting calendar, turf insect injury key and an example of a pest scouting sheet. This publication, along with Protection Guide for Turfgrass provides a complete reference package on turf IPM for Ontario. This publication combines the former Diseases and Insects of Turfgrass in Ontario and Turf IPM Manual. It contains information on turfgrass soil management and fertilizer use, turfgrass species and water management for turf. The Protection Guide for Turfgrass can be downloaded from the OMAFRA website.